Brunch. America’s favorite weekend passtime. The perfect blend of breakfast and lunch. The gut-wrenching decision of sweet versus savory. It’s an excuse to drink before noon and a reason to sit and chat with friends for hours judgement free. During this time of year, it’s time to soak up the final rays of sunshine and warmth before the heat goes away and the cold creeps in. Are you a sweet or savory bruncher? Would you prefer to dig in to a giant stack of fluffy buttermilk pancakes or a cheesy 5-egg omelet? Maybe you prefer having a combination of the two? I’m definitely the latter. Give me sweet and savory and I’m a happy girl. While the warmer days may be limited, Chicago will stretch patio season out well into fall as long as it’s not snowing. 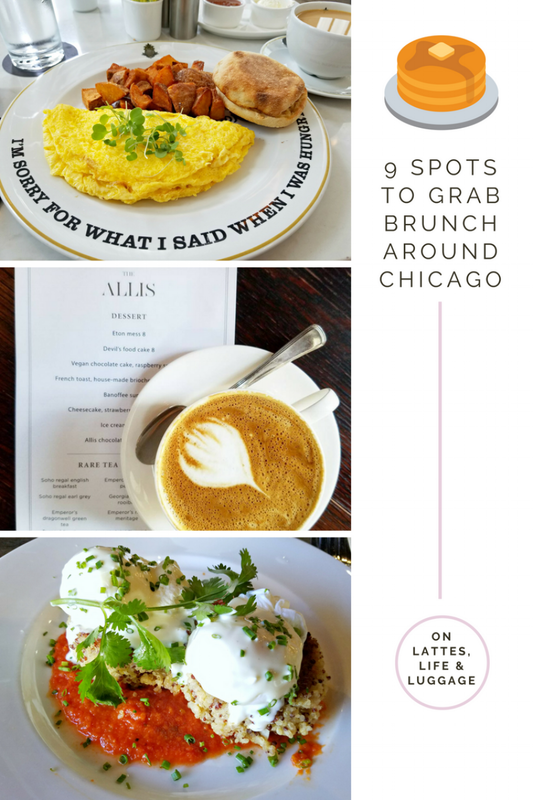 So whether you prefer an outdoor or indoor brunch, we’ve got a list of nine restaurants to indulge the favorite weekend meal. Dig in, Chicago! Located inside the gorgeous Alise Hotel, Atwood serves up contemporary American cuisine with local ingredients. With a menu leaning more towards the savory side of breakfast dishes, grab classics like Steak & Eggs to interesting twists like the Grilled Cheese featuring tomato jam and smoked gouda. The Atwood Omelet available for brunch and breakfast (lucky you), is a unique combination of ingredients that is delish. Bacon, caramelized onions, and Brie melt together in a fluffy, delightful omelet. 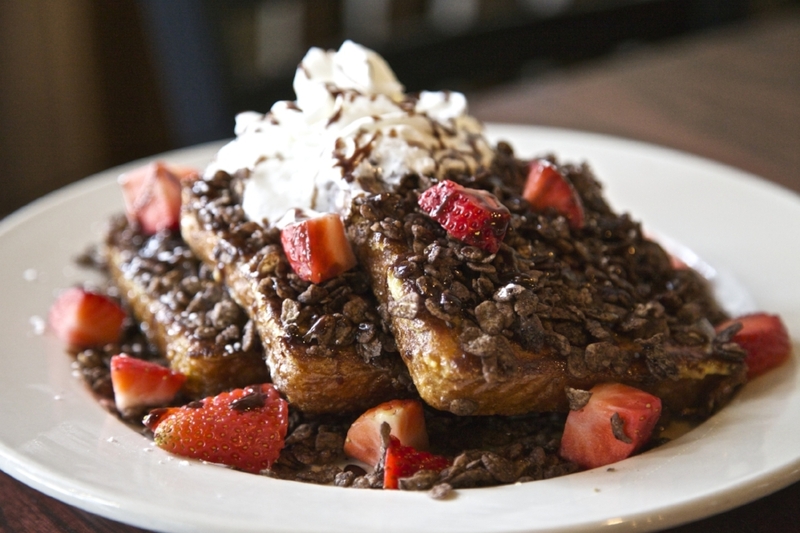 For something sweet, dig into the Monte Cristo French Toast. It’s hard to deny raspberry preserves! Brunch is available at Atwood Saturdays & Sundays and Breakfast is served weekdays. Beatrix has several locations around the city, one of them being in River North not too far from the Magnificent Mile. Known for having a great breakfast and brunch, Beatrix serves up healthier dishes that are still tasty. Each location also has a coffee bar with pastries so you can grab a latte on your way out! The Quinoa Cakes with Poached Eggs are an interesting change from more classic options. The tomato-basil sauce is a showstopper and you'll wish you had more of it to slather the egg and quinoa cakes with. It looks like a heavy meal but it’s much lighter than it seems. It’s equally fit for a hot day or cold winter day. The Beatrix River North location offers Brunch Saturdays & Sundays from 8AM - 3PM and Breakfast is served weekdays from 7AM - 11AM. If you’re already in the suburbs or willing to make the trek outside of city limits, FourteenSixteen in LaGrange has got a bomb brunch. My closest friend from pre-high school days met me here one very hot summer Saturday for a brunch that had both of us clearing our plates. Disclaimer, you will have a terrible time choosing from the menu. Everything looks so good, especially if you see dish after dish come out of the kitchen. It’s practically impossible to make a decision and most likely accounted for half of our visit. The Pork Belly Hash is particularly fantastic. The pork melts in your mouth and everything from the avocado to queso fresco complement the dish beautifully. I have it on good authority that the Chicken Waffles and Beignets are worth a try too. Weekend Brunch at FourteenSixteen is available Saturdays & Sundays from 10AM - 2PM. Flo is a favorite brunch spot for locals. The first time I visited this New Mexican restaurant, I discovered the wonderful world of Fruity Pebbles French Toast. If you haven’t tried it yet, do so quickly. It’s the most amazing, unexpectedly delightful breakfast dish you’ll have. It was this dish that had me returning to Flo time and time again. I have branched out of Fruity Pebbles heaven though. The Bacon-Chocolate Pancakes are simply to-die-for, the Chorizo Scramble is my dream egg dish, and the Huevos Rancheros are also amazing. You’ll find classic brunch dishes here and a few way out of the ordinary. Regardless of your choice, the food is always outstanding and the experience casual. It’s more than likely those two reasons why locals keep going back for more. Brunch is available at Flo Saturdays from 9AM - 3PM and Sundays from 9AM - 2PM. Breakfast is served weekdays starting at 8:30AM. It’s time for a throwback. You know that one place you find in college that becomes the go-to for your close group of friends? Jam n’ Honey is basically that for anyone living on the DePaul University Lincoln Park campus. Don’t let the potential to run into crowds of college students deter you from trying Jam n’ Honey because it’s well worth it. From fluffy pancakes to a variety of eggs benedict, this corner restaurant on a college campus is offering comfort food, hangover food, and plain good-for-the-soul food. They’re also known for having an abundance of Nutella, one on each table to be specific. Have I sold you yet? I’ll meet you there! Jam n’ Honey opens at 8AM every day. Stephanie Izard created a diner that Chicago didn’t realized it needed with Little Goat. I have been to one too many events during dinner time where the food has been scarce or non-existent. The first place that comes to mind every single time this happens is Little Goat. And while that may be dinner time, Little Goat offers a breakfast menu all day long so if you want an early breakfast, brunch or breakfast for dinner, you can have it! Little Goat Diner is SO good because you won’t find anything traditional on the menu. Instead of pancakes, you get Dark Chocolate Chip Crunch Pancakes. Instead of a generic egg hash, you get Smoked Corned Beef Hash with Eggs. Instead of French Toast, you get Bull’s Eye French Toast featuring crispy chicken and bbq maple syrup. Need I go on? It is brunch so if you’re feeling something a little more lunchy, dig in to one of the juicy, flavor-packed burgers. The Patty Melt is particularly mind-blowing. If that wasn’t enough, get a shake, get a cappuccino, get a pastry…and if you get there early enough, get one of their famous Cinnabuns. Little Goat Diner opens at 7AM every day. Lula Cafe is at the heart of Logan Square’s culinary scene. One of the pioneers of the farm-to-table movement in Chicago, Chef Jason Hammel established a neighborhood restaurant that Chicagoans come from all over the city to visit. If you’re not a local, that means a lot because getting to the west neighborhoods is not easy if you’re not already in the western area. Their menu rotates seasonally using locally sourced ingredients and it’s rare you’ll hear someone say they didn’t enjoy a meal at Lula Cafe. Warning: this is a very popular spot and can get crowded fast. Reservations are only accepted after 5:30PM. If you plan to visit on the weekend, get there early or prepare to wait. It will be well worth it if you do. Lula Cafe opens daily at 9AM, except Tuesdays when they are closed. Another restaurant by Chef Jason Hammel, Marisol at the Museum of Contemporary Art is worth a visit for the experience as much as the food. The best part of Marisol might just be the daily housemade doughnut. Flavors vary each day so it’s always a surprise what you’ll get but they are always delicious. Marisol also features a seasonal menu to embrace local ingredients and the best flavors of the season. While dining, make sure to take in the art around you. The restaurant was designed to be an immersive experience created by artist Chris Ofili. Brunch is available at Marisol Saturdays & Sundays from 10AM - 2:30PM. My home away from home. The Allis at Soho House is one of the hardest places for me to describe. The decor is a mix of vintage and elegance, rustic and modern, sophisticated and casual. The service is always friendly. The food is always spectacular. I genuinely mean it when I say that I’ve enjoyed every single bite at this restaurant and there have been many. From the French Toast to the Baked Eggs, every taste bud is tantalized. The espresso is spot on and their bread is worth a visit all on its own. Confession: I normally like to order egg dishes just so I can have the bread with jam.